When we recently traveled to west Texas to visit my aunt, she picked up a couple of loaves of our favorite jalapeno cheese bread for us to enjoy while we were there. I told her that every time we visit & enjoy that delicious bread I get the idea to come home & bake up bread with jalapenos & cheese. But it’s just not the same because I’m usually making biscuits or flavored beer bread & not a fluffy yeast bread. 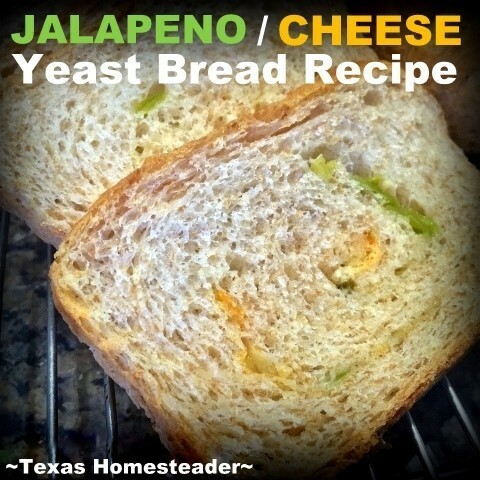 So recently when I was baking RancherMan his favorite sandwich bread I made one into a jalapeno cheese bread. 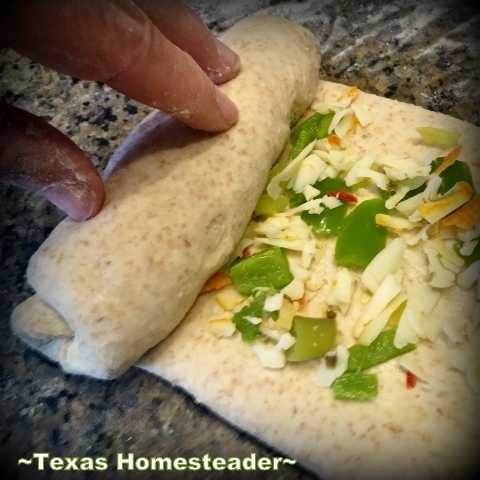 It was as simple as rolling it out, sprinkling chopped previously-frozen jalapenos from the freezer and some grated jalapeno muenster cheese given to us by a very sweet friend before rolling the dough into a loaf. But did it work? YES! RancherMan is over the moon over this spicy bread! And of course you can make it as spicy or cheesy as you like. Mildly spicy? Sure. Wildly spicy? You bet. Very cheesy? Go for it! Since I didn’t want to eliminate one of RancherMan’s sandwich loaves, I used my regular sandwich bread recipe & amended the ingredients to make 3 loaves instead of 2. Then when I rolled out the bread dough to roll out into logs, I rolled one a little thinner than normal. I sprinkled that thinner rectangle with about 3 chopped jalapenos & some shredded cheese. Then I rolled it onto a loaf, let it do the final rise, and baked it up along with the other two loaves. BOOM! RancherMan raved, and that always makes me smile. You can do as I did and follow my exact same Sandwich Bread Recipe and just sprinkle on the spicy deliciousness for a jalapeno cheese loaf when you roll the dough into a log. Your family will love it as much as we do! Oh man, this looks delicious! I think we may even still have a few jalapenos from last year’s crop. If not, we’re planting some more now. Thanks for sharing on the Waste Less Wednesday Blog Hop. Sounds so good!! My 14 year old daughter and I love spicy foods. I am definitely putting this onto the must try list! We have made jalapeno/cheese cornbread which we love. Having it as a sandwich bread would be delicious I bet. This looks perfect! I will be trying it very soon!